It was spinnakers from the start for the 12 Entrants of the Grey Silkie sponsored PYRA race from Poole to St Vaast on Friday the 17th of June. With a light NW wind dead astern, progress was slow for all boats, and with little prospect of arriving before the lock gates closed for the Class 3 and Class 4 boats, engines were fired up and they motored across the Channel. All eyes were on the new Grey Silkie, on her first outing, which for a brand new Hallberg Rassy with an undersized borrowed spinnaker was making almost indecent haste in the light stuff, a boat to be watched! Further ahead the fleet split, with Deity, Grey Silkie, Amethyst and Virago initially choosing the more westerly route, and Blue Extasy, Destiny, Dequilla and Maris Otter more to the east. The wind backed and increased giving a sparkling spinnaker reach in good sunshine- champagne sailing conditions. Towards the French coat Amethyst closed the Cotentin west of Pte De Barflear, then ran down the shore to take advantage of the east going current towards Pointe de Barfleur. Deity and Blue Extasy went further east, then struggled to hold their kites as they closed on the finish against the last of the tide. Destiny took the inshore route, passing close by Pointe de Barfleur at times seeing over 11kts over the ground having been able to take advantage of arriving a little later to catch the south going tide as they headed round the cardinal marks to the finish. Line honours went to Amethyst followed by Blue Extasy and Grey Silke with Destiny taking the win on corrected time followed by Blue Exstasy and Grey Silke. In Class 2, Line honours went to Dequilla followed by Virago, Supanova and Marris Otter but on corrected time Marris Otter took the win in an incredibly tight finish with only 1 minute spanning the top 3 boats after 12 hours of racing! The return race started in a light SW wind, so again spinnakers were flown from the off, but these disappeared after about half an hour as the fleet was headed. Boats that ventured inshore up to Pte de Barfleur benefited from the eddy current, and initially the fleet were close reaching as they left the French coastline. Again there was a split on tidal tactics, with Blue Exstasy, Destiny, Maris Otter and Amethyst staying west and Deity, Grey Silkie and Dequilla a couple of miles further to leeward. 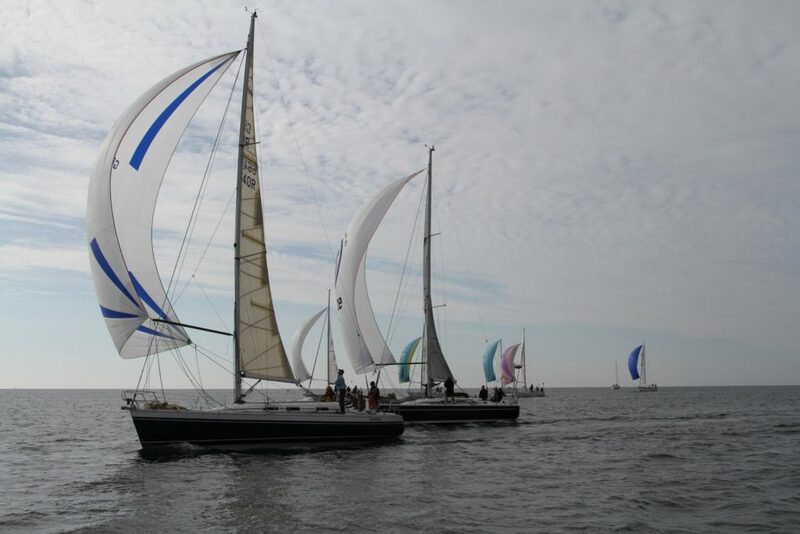 The wind started to back and increase, with Destiny and Deity first to show their assymetric spinnakers, with other boats launching soon afterwards. The race then turned into a bit of a sleigh ride, albeit in steady rain and intermittent visibility, as the wind settled in the SW and increased up to 28kts at times. Those that held their kites enjoyed exhilarating sailing, with Destiny taking the win in Class 1 narrowly ahead of Blue Extasy and Deity. Class 2 was won by Maris Otter followed by Dequilla and Virago. Class 3 was won by Wild Rival.